Description: Mid-October, Tampa-Taft-Tampa turn O682 ran in daylight with some unusual power & long shifts. Here, they are pulling up to "Rachel's" in Taft to recrew as O982 back to Tampa. Description: CSX 5227 still in primer was shot at Race Pond, GA along US 1 between Waycross and Folkston, GA. Description: CSX Q438 heading north at Edgewood Rd. 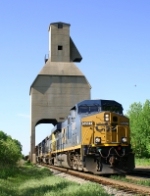 Description: The Q645 roars south under the Sullivan coaling tower. Description: Q168 rolls east at 10:03 with CSX 5227 and 8843. Description: The 5227 passes by at close quarters. This location is actually on a side street in Hamlet. Description: CSX 5227 cruises in from the East, showing the Hamlet depot in the background. 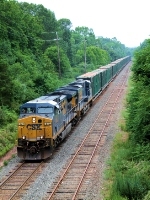 Description: A pair of CSX GEVOs, the 5433 and 5227, lead a stack train west at Milepost 215. Description: NB after crossing the Manatee River. Description: Q116 comes flying through Westfield as it approaches the Williams Riding Way grade crossing at 8:53. Description: Q116 flying by Salt City in Westfield behind the usual pair of widecabs. Description: Another W082 heads EB for MA? with its orange hoppers. This work train has been going back and forth over the past week several times. It has been caught in Massachusetts by members of a yahoo group I am on. Well, guys, here it comes again! Caught tonight at 1929. Description: Camp Meeting Avenue bridge, 1334 hours. Description: CSX stack train Q191 eases westbound on the Morrisville Line connector alongside the old PRR Schuylkill Division row.